©Rafika Hama / Fondation Hirondelle Five women's rights activists in Niger, during their visit at Studio Kalangou on May 13, 2018. May 13, 1991 - May 8, 2018. 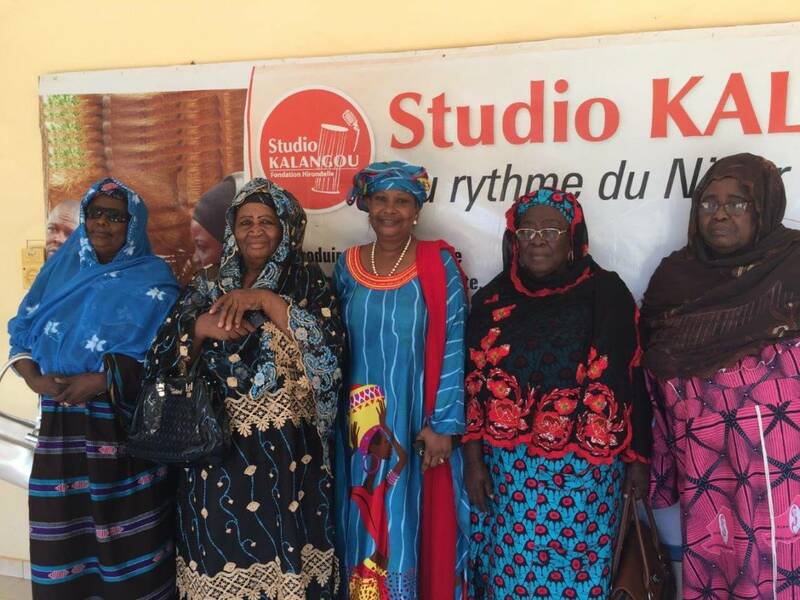 27 years later, we welcome at Studio Kalangou 5 actresses of one of the founding moments of the struggle for the political rights of women in Niger: the historic march of May 13, 1991, during which these committed activists stood up to demand the participation of women in the conference July 1991. They are Ms. Bayard; Mounkaila, Kanta, Kondo and Amirou Hassane. They have just completed the recording of the first program of a series that the newsroom of Studio Kalangou, Fondation Hirondelle's news program in Niger, has decided to devote to women's rights and gender equality , in cycles of ten episodes. The first cycle of these programs started on May 13, 2018, on the occasion of the national day of the Nigerian woman. It is devoted to the right to political participation of women in Niger. Through the portraits and the testimonies of these women, we will explain in 10 forums and 10 weekly magazines declined in our 5 broadcasting languages ​ (French, Zerma, Hausa, Fulfulde and Tamasheq) what were their objectives, what political advances for the women they have obtained through their mobilization, what obstacles they have encountered and what message they send to the younger generations of women and men so that they too can become involved. This transmission is all the more important as one Nigerian out of two is under 15 years old. Women make up half of Niger's population. The discourse of development actors regularly emphasizes the need to empower women to act on their own destiny and in their community, through different empowerment strategies (political, social, economic). But in fact, we are still far from it. The quota law provides for a female participation of 10% in elective positions and 25% in appointments. This quota was raised in 2014 to 15% of women elected but the decree of application is not yet signed. In May 2018, they are 29 out of 170 deputies, 7 out of 42 ministers, 2 prefects out of 67, and 7 out of 277 mayors. Of course, it is much more than the only female member of parliament who has served for several years at the National Assembly. But the quota, although modest, is not yet respected. These inequalities are built from the ground up, at school. 76% of girls aged 10 to 19 cannot read or write. This under-representation of women is also found in the media, including ours. In view of our commitment to inform all citizens of Niger and particularly those who are the least often addressed and who are the most marginalized in the media, most of them women, it seemed important to us to launch a challenge: to produce more regularly, and sustainably, on "women" themes. If we want a different society, more egalitarian and more respectful of women's rights, we must also show another reality, that of women, illustrious or anonymous, who work to build their community, and highlight the difficulties that they meet to provoke an awareness, without which there can be no progress. The first series on political participation started with a special edition broadcast on Sunday, May 13 at 5 pm on the entire network of 34 radio partners of Studio Kalangou. Then, for two months, every Monday from May 14, we offer a magazine in each newsletter in five languages, and a forum in French. Listeners will be able to follow these forums in Zerma and Hausa every 15 days, on Saturdays and Sundays.